Reviews, surveys and reports for coffee business professionals. Reviews, surveys and market research for coffee business professionals. Our reviews of the iCoffee Opus brewer and some Rogers Family coffee attracted enough attention to get featured on their sites. The Coffee Detective website has been online since 2006, and its primary purpose is to help coffee lovers brew and enjoy a better cup of coffee. However, as our audience has grown, we have also been able to serve the needs of coffee professionals in a number of different ways. 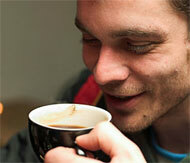 Coffee Reviews: Reviewing gourmet coffees in language every coffee lover can understand. Professional cuppers do a great job, but sometimes the language they use to describe the tastes and flavors of coffees is a little technical for us mortal folks. In our reviews we try to stick to everyday language, so all our readers can understand. "I love the review, this guy knows his cupping, he is speaking my language when he describes tropical fruits, nuts, molasses and he also went on to describe the lemony peaberry. Very few people are able to discern the lemony note that is a hallmark of a top notch peaberry roast." If you are the roaster or distributor of a coffee you would like us to review, please get in touch with us through our contact page. Equipment Reviews: Video reviews of coffee makers, coffee grinders and other equipment. Our video reviews of coffee-making equipment have proved to be very popular. We post them on this site and on YouTube. At the time of writing, these videos reviews have been seen almost 500,000 times. If you have coffee-making equipment you would like us to review, please get in touch with us through our contact page. Reader Surveys: The brewers they use, the coffees they like, and where they buy. So far we have conducted three online surveys,designed to reveal our readers' preferences when it comes to the coffees they drink and the coffee equipment they use. If,as a business, you would like us to conduct a survey of our readers on your behalf, please contact us through our contact page.